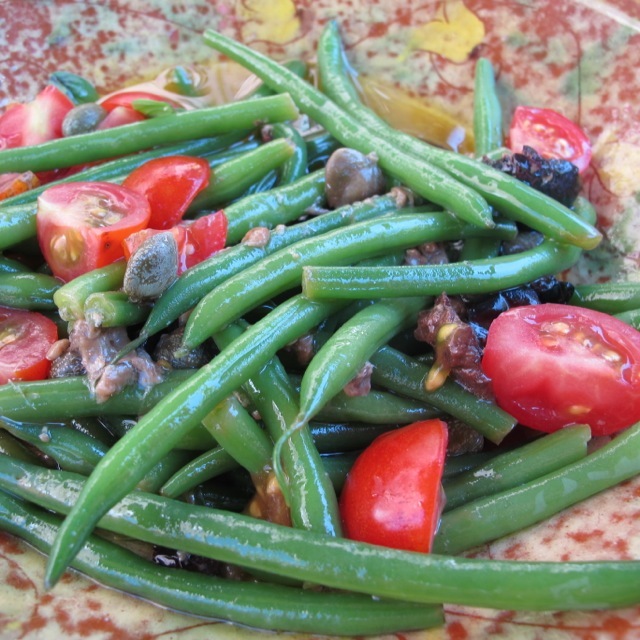 Seasonal vegetables are at last piled high in the markets now–everything is late this year–and haricot verts [green beans] are perennial favorites here. Alice, our generous French neighbour, delivered a bagful, freshly picked this morning from her pottage. We’ll eat them today unadorned, apart from a little salt and a swirl of the best olive oil we have. This is a handy alternative. Our friend, Jane, made these for us recently and reminded me that the recipe is based on one in the little vegetable book from the River Café collection. 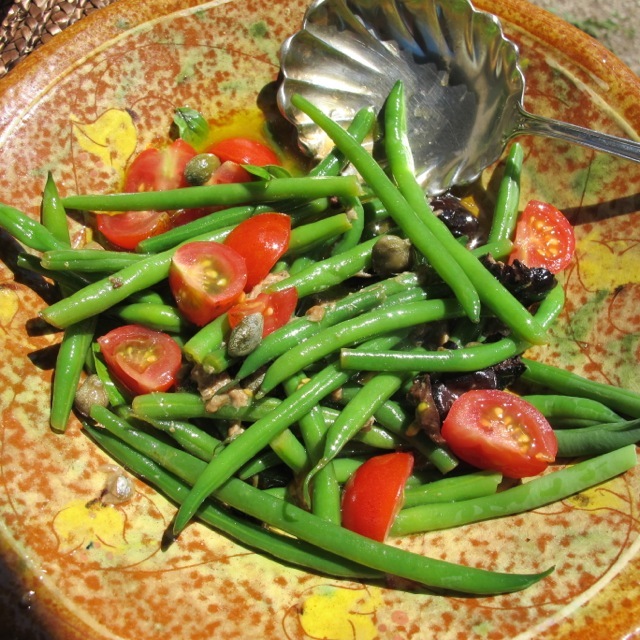 The beans are lightly coated with an anchovy and caper sauce with sweet cherry tomato quarters and basil added. If you are not keen on anchovies, leave them out–it’s still worth doing. We had them as a starter last night. handful ripe cherry tomatoes–carefully quartered; watch out for your fingers! Cook the beans in plenty of salted water to just tender. Drain them, put them in a mixing bowl and coat them with two tablespoons of olive oil (best you have available). In another bowl combine the lemon juice and the remaining two tablespoons of olive oil. Snip in the anchovy fillets and add the capers and the stoned olives. Season with black pepper and salt–bearing in mind the saltiness of the anchovies and olives. Add another tablespoon of olive oil, if needed. Spoon this sauce over the beans and mix. Carefully transfer the beans to a favourite serving plate and scatter over the tomatoes and basil. Hi Robin. Perfect timing, I couldn’t think of any new ways to prepare the beans from the garden. This recipe sounds wonderful, will try it tomorrow. Jane, hi–hope it turns out well. Good start with your garden beans. The combination of anchovies & capers is one we absolutely find addictive in this house…mix that in with olives, lemon & sweet tomato and that’s my idea of heaven on a plate! Luckily, we have a Graham instead of an Alice who brings us gorgeous beans from 3 doors away…so they are likely to get the Ellis treatment soon! I can also imagine it with chard, spinach or tender stem broccoli. Absolutely delicious! Have a great weekend both of you…it’s set to be warm & sunny here, summer’s final fling! Anything with anchovies is always high on my list. I don’t mind capers, but I cannot serve them to my husband due to his tummy. Still, I can add a couple of more cherry tomatoes and an extra anchovy and everyone will be happy. There you go! nothing need stay as per. Yummy – my type of food too 🙂 Thanks for sharing Robin – inspiring! We had this dish last night and it was wonderful! I substituted green olives for the black ones and the capers, and used a bit less oil, and it was so delicious we inhaled it. The anchovies with the olive oil and lemon juice were such a good sauce I am going to try it with other vegetables, thank you so much.